Very quick and simple version of the classic Hollandaise Sauce prepared with a blender. Same taste, same consistency, but faster, EASIER, and absolutely foolproof. 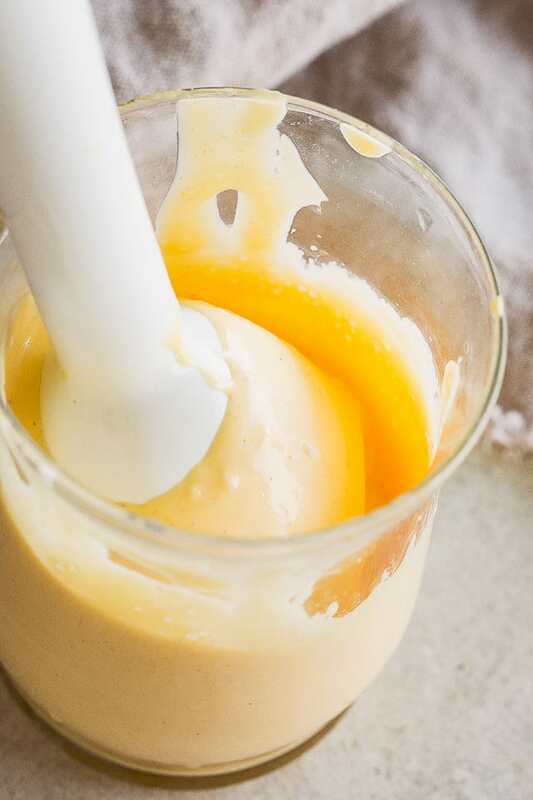 Creamy, buttery and easy Blender Hollandaise Sauce eliminates the task of whisking egg yolks because your immersion blender does all the work. You can have your poached eggs, fish, or vegetables deliciously sauced in just under 5 minutes with very little effort. I have to admit to you; the first time I made Hollandaise Sauce, I thought I was the IT. I was THE gourmet chef I always wanted to be. In fact, most fancy sauces prepared by me, make me feel like the queen of the kitchen. 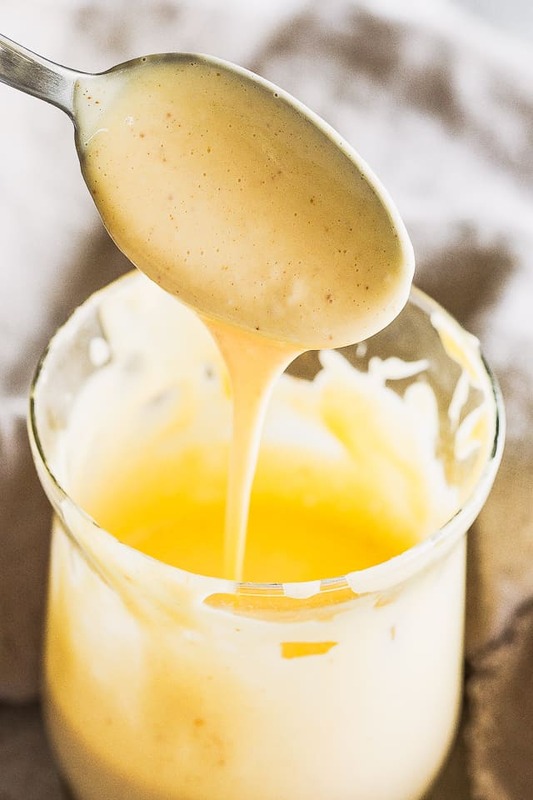 Even if it’s just your truly easy Honey Mustard Sauce. Or something more complex, like Bechamel Sauce. When I learned that Hollandaise sauce can be made with just my handheld blender, I never looked back. Forget the double boiler, the constant whisking, and the chance of sauce separating. With this recipe, you will create an amazing Hollandaise Sauce that comes out perfect each and every time. Also, with ZERO grams of carbs and ZERO grams of sugar, this is the ideal sauce for those on Keto or a Low Carb lifestyle. This recipe has all the same ingredients as the classic; egg yolks, lemon juice, cayenne pepper, and melted butter, but I also like to include a tiny bit of French mustard for more flavor. HOW DO YOU MAKE HOLLANDAISE SAUCE WITH A BLENDER? 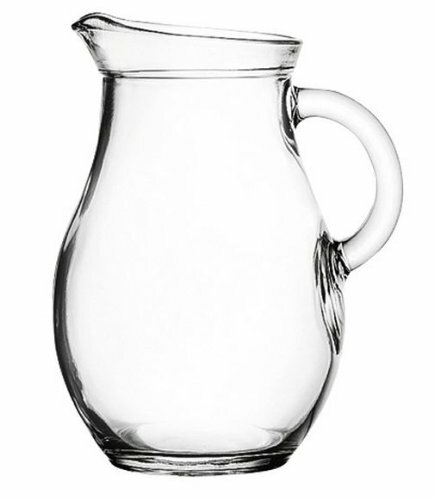 This recipe requires an immersion blender + a wide mouthed mason jar. The jar needs to be wide enough for the immersion blender to fit inside of it. The measuring cup that’s included with most immersion blenders works really well with this recipe. It’s tall enough and wide enough. Please do not use a bowl – it won’t work because it’s too wide. Start with adding egg yolks, lemon juice, salt, cayenne pepper, and mustard to the jar. Meanwhile, melt 8 tablespoons of butter in your microwave. Pull it out and let stand for about 30 seconds. Grab the immersion blender and stick it inside the jar. Pour the butter in a thin stream and start to blend at the same time. While blending, move up and down with the blender so to combine everything together, and to thicken. This should only take about 30 seconds. Taste for seasonings and adjust accordingly. I almost always add more lemon juice and salt. If it’s too thick, you can add couple teaspoons of water and stir with a fork until combined. IS IT SAFE TO EAT HOLLANDAISE SAUCE? 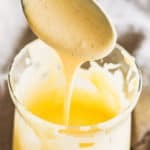 Hollandaise sauce is made with raw egg yolks which is why many people are uneasy about using it. If this is you, I suggest buying pasteurized egg yolks. From personal experience, I have never had any issues with eating Hollandaise Sauce that was made with raw egg yolks. Knock on wood! Adding acid (in this case, lemon juice) raises the temperature at which egg yolks cook, so we can heat them to 140F, killing the bacteria, but without cooking the egg. The hot butter also helps in cooking the egg yolks to about 145F to 150F, which is considered SAFE for consumption. Anything over 150F, and you’re risking the chance of curdled, scrambled eggs. WHAT CAN YOU EAT WITH HOLLANDAISE SAUCE? Cover freshly made hollandaise sauce with plastic wrap to keep it warm. Use within 1 to 2 hours. Refrigerate any leftover sauce after 2 hours of cooking. Keep covered and in the fridge for 1 to 2 days. Very quick and simple version of the classic Hollandaise Sauce recipe prepared with a blender. Melt 8 tablespoons butter in the microwave. 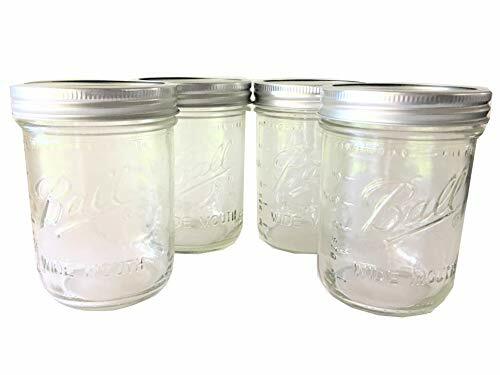 In the meantime, add egg yolks, lemon juice, salt, cayenne pepper, and mustard to a wide mouthed mason jar. Remove butter from microwave and let stand about 30 to 40 seconds. Grab the immersion blender and stick it inside the jar. Pour the butter into the egg yolk mixture in a thin stream and begin to blend at the same time. 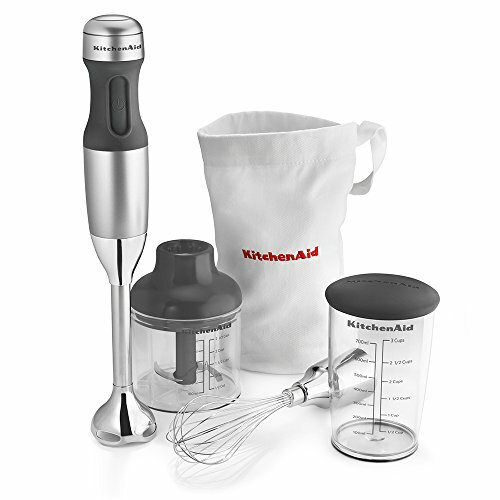 While blending, move the immersion blender up and down, slowly, so to combine everything together, and to thicken. This should only take about 30 seconds. Remove blender and taste for seasonings and flavor; adjust accordingly. If it’s too thick, you can add couple teaspoons of water or lemon juice, and stir with a fork until combined. Sauce will thicken as it stands; stir in more liquid as necessary. Use within 1 to 2 hours of making; refrigerate any leftover sauce after 2 hours of cooking. Keep covered and in the fridge for 2 days. This is the ONLY way to make Hollandaise (or mayo if using oil)! Would it not be so much easier to weigh butter rather than measure out tablespoons…at 14 grams each it is 112 grams. Love how easy this is! My husband LOVES hollandaise….can’t wait to try it! Looks perfect! So simple yet incredibly yummy, looking forward to trying this! This is my favorite sauce! I am so glad to make it at home! 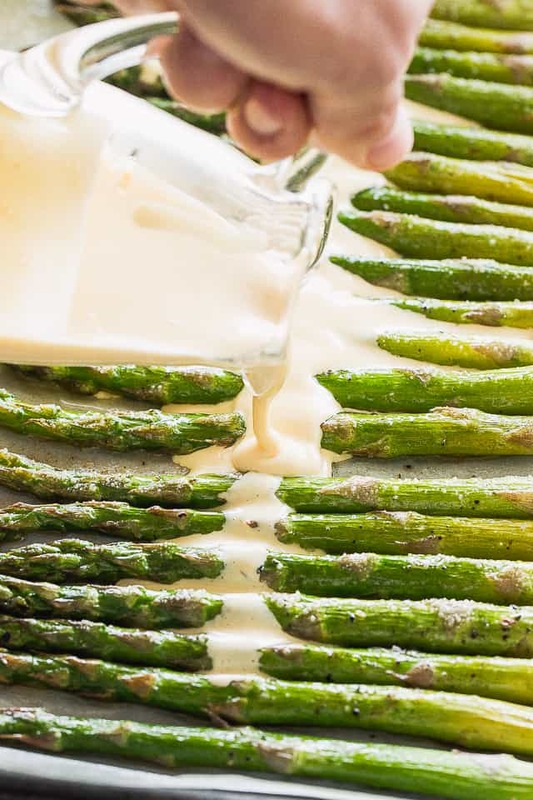 Hollandaise sauce on asparagus is one of my favorite dishes! Love how quick and easy it is to make this! Thank like so much I will use this very often !! I’m all about making things easy so this sauce is perfect for our busy family! It really couldn’t get any quicker than this! So easy that everyone can look like a pro, thanks. This is really awesome! Thank you so much for the tips! This is my favorite! Thanks so much for a great recipe! Love this sauce! So good. Always looking to make things easier! Great recipe! Thank you!